When I was young, spending the day at my grandmother’s house, I discovered a picture book she had on the concept of heaven. The afterlife was drawn as a glorious space, and the intent was to affirm a promise. Instead, my warped young brain that has only changed so much was appalled. I openly wept, terrified at the core mechanic of heaven: it never ends. It was unfathomable to me, this notion that something continued forever, never ceasing. Often, I still struggle with the idea, but at that young age it read like a horror tale. What was this “infinite”? How could it be? Despite any shifts in my religious affiliation, the idea still permeates my mind often. One of my favorite science fiction sub-genres is that of the alternate universe; versions of us, reaching out in an never-ending line, different permutations of my identity throughout. Somewhere, right now, I’m the President of the United States. Actually, if we truly stretch this theory to its natural conclusion, there are an unlimited number of universes in which I’m the president, each one slightly unique from the others. What once scared me as a child now fascinates me. If every single version of me that could exist does exist, the possibilities are endless. Of course, if I follow this thought for too long, I still grow worried, but for a more existential reason than my young mind could have processed. The consciousness here, the one writing this article at this moment, is the one I happen to inhabit. Agreeing on this, as it seems quite likely, the question becomes “why?” What governing force, or series of happenstance, led to the now that I’m currently experiencing? The question breaches the fate/choice debate, and beyond into nearly every aspect of human experience. At this point in my life, though, as I ready a move across the country, away from the places and people I’ve know for the entirety of my life, I circle around to a thought more personal than scientific. Rick & Morty’s “Rixty Minutes”, the best episode of television so far this year, asks a number of these questions, or at least variations on them. The episode is centered around a universe-hopping cable box that leads to the treacherous road of “what if”. 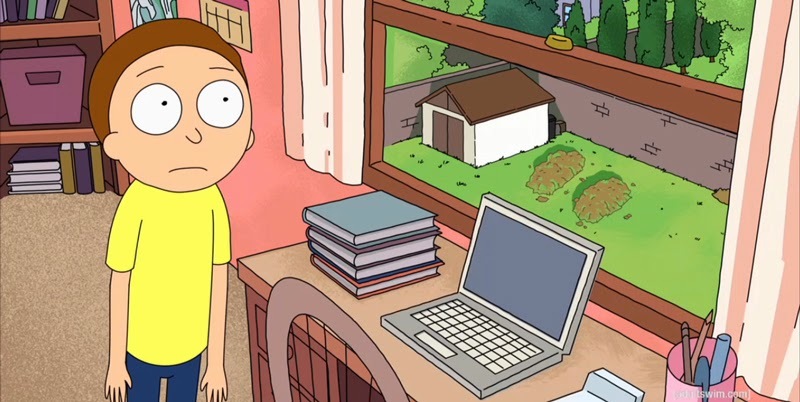 One of the characters, Morty’s father Jerry, discovers that somewhere out there in the beyond he’s more successful than he’s ever been on this version of Earth. While the title characters channel surf, Jerry, his wife Beth and their daughter Summer explore all of the people they could have become, had different paths been taken. Jerry could be doing coke with Johnny Depp, for example, instead of dealing with his father-in-law’s wacky and often cruel inventions. And Summer discovers the tragic fact that her birth led to the disintegration of her parents’ dreams. This leads to Summer looking to escape, feeling the weight of her parents considering her existence a burden. That’s when Morty reveals a twist the show had planted episodes before, one that gives poignancy to his next words: “Nobody exists on purpose. Nobody belongs anywhere. Everybody’s gonna die. Come watch TV?” The moment sits there, and though the episode snowballs to a relatively happy ending, that idea doesn’t dissipate in its aftermath. Though every aspect of that line, especially the escape of television, hits violently close to home, the idea of nobody belonging is potent. Morty’s secret proves the notion that where you are isn’t nearly as important as who you are, though the two are often shaped by each other. There may be an infinite number of me doing an infinite number of different things, but I am the one that I happen to be. It can be jarring to consider the possibility of being happier if only you had done one thing differently. But it can also be comforting to know that, for whatever reason, you happen to be here, in this mind, doing these things. If “nobody exists on purpose,” isn’t there a kind of freedom to that? Season six, the beginning of the quality downturn for the sitcom Friends, did contain an episode that had something to say even if it wasn’t a series high. “The One That Could Have Been” explores a universe where every main character has made one crucial choice that keeps them from who they were when the show began. Ross didn’t divorce his lesbian wife, Monica never lost weight, Chandler pursued a writing career and so on. The two-parter ends with the central six in Central Perk, having found their ways to each other despite the monumental shifts that came before. That ending could be waved away by the necessity for a network sitcom to end on a pleasant note, but there’s clearly more than that going on here. The point that the episode is making is that these people are intrinsically drawn to one another, and no matter how many mistakes they make along the way, they’ll always end up in the same place. This is an ultimate good in the context of the episode, where none of their futures were working out well. But it may also be a positive in the context of real life. The reason we consult loved ones, make pro-and-con lists and google even the most mundane of questions is because decisions can be terrifying. If there’s a right way to do something, there’s often a wrong way as well, and committing to one or the other can be paralyzing. This is true in careers, romantic relationships and even friendships. And most troubling of all can be those unforeseen consequences. If I had attended a different college, I would not have known the people that I would have missed here in Chicago. There would be no reason to sit awake at night, thinking of the specific best friends I did not have. We may be able to predict the immediate outcome of a choice, but we’re not just opening a door when we commit to something, we’re knocking down a series of dominos. It’s impossible to know the exact definition of one route opposed to another, especially years down the line. So the promise that the outcome will be similar is welcome. Specifically, that Friends episode says that we end up with the people we’re meant to be with. Of course there’s no way to definitively prove this. But, thrillingly, it’s impossible to disprove. We don’t have a window into an alternate dimension as evidence that we missed out on a better group of friends. We’re stuck with the life we have, at least in the moment. This doesn’t strike down the opportunity for change, or lessen the responsibility of motive, but it relieves a bit of the concern. And maybe it is simpler than that. Maybe the infinite is so terrifying because we are perversely singular beings made up of these exact atoms at this precise moment. The time is now and the place is here and these are simple truths we must grapple with, multiple universes or not. I am grateful for the years and memories and triumphs and struggles each person in my life has given me. I cannot prove that these same people stand beside me in every iteration of my experiences. I don’t need to prove that. Instead, I will happily acknowledge that I met these people because, for whatever inexplicable reason, I happened to meet them. Like I said, there’s some comfort in the elusiveness of fact.